Guests enjoyed a lively atmosphere during the luncheon. 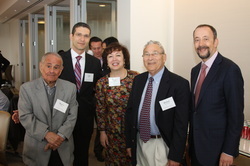 Here, I-SAEF Founders Lev and Galina Leytes pose with some key I-SAEF supporters: Maurice Kanbar, Richard Rosenberg, and Andy David, Consul General of Israel to the Pacific North West. 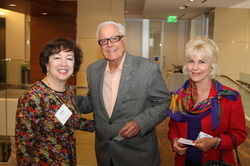 Long-time supporters Jack and Candee Klein pose with I-SAEF Vice President and Co-Founder Galina Leytes. I-SAEF supporter Gladys Monroy, Senior Partner at Morrison Foerster, poses for a photo with Jonathan Axelrad, of Wilson Sonsini Goodrich & Rosati. 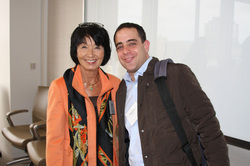 Gladys, a long-time friend and supporter of I-SAEF, kindly offered her firm's boardroom for the event. Jonathan can frequently be heard speaking about environmental and energy issues, including for JREC, the Jewish Response to the Energy Challenge. 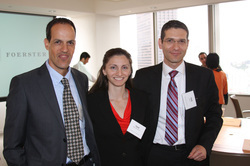 Israelis were well-represented, highlighting I-SAEF's importance in this critical initiative. Eyal Rosner, keynote speaker for the event, poses for a photo with Sigal Admony-Ravid, Israeli Consul for Economic Affairs, and Consul General Andy David.